A blow or a jolt to the head can cause a concussion or traumatic brain injury (TBI). The injury keeps the brain from working normally. Symptoms of a concussion may last less than a day or may linger for months, or longer. 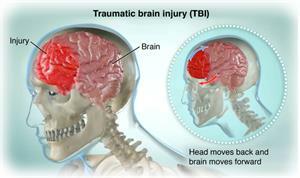 Millions of mild traumatic brain injuries occur in the U.S. each year, but most don't require a visit to the hospital. What are the causes of concussions? Many concussions that require emergency treatment are because of falls, motor vehicle accidents, assaults, and sports injuries. Children, young adults, and older adults are at especially high risk for concussions and may take longer to recover after a concussion. People who have had concussions before are more likely to have them again. These symptoms may occur right away. But some may not start for weeks or even months after the injury. To diagnose a concussion, your doctor will probably ask you a variety of questions. Be sure to say if you lost consciousness and report any other symptoms. The doctor will also want to know how the injury occurred and where you hit your head. You may also be asked questions to test your memory and asked to do certain tasks to show how well your brain is functioning. Your doctor may also ask your friends or family questions about your symptoms and the injury. Images of your brain using CT or MRI scans may be taken and evaluated. An important part of treatment for a concussion is getting plenty of rest, both sleep at night and naps or rest breaks during the day if needed. Your doctor will probably tell you to avoid certain physical activities and sports while you recover and may suggest medicine to take if you have a headache. If your symptoms don't go away in a few days or if they get worse, you may need to see a doctor who specializes in concussions. Wear a seat belt every time you're in a motor vehicle. Make sure your children use the proper safety seat, booster seat, or seat belt. Never drive under the influence of drugs or alcohol. Wear a helmet for activities such as riding a bike or motorcycle, playing contact sports, skiing, horseback riding, and snowboarding. Reduce your risk for falls by eliminating clutter in your home, removing slippery area rugs, and installing grab bars in the bathroom if needed, especially for older adults. Never work on a ladder if you feel dizzy or lightheaded. Alcohol can make you dizzy. Some medicines also can make you dizzy or affect your balance. Have your vision checked at least once a year. Poor vision can increase your risk for falls and other types of accidents. After a concussion, your healthcare provider may decide to monitor you in the emergency room. When you’re released, the provider will want someone to stay with you at home for a day or 2 to keep track of your condition. Follow your healthcare provider’s directions about avoiding sports, physical education classes, and activities such as running and bicycling while you are recovering. Limit activities that require you to concentrate heavily. This includes taking tests if you are in school or doing tasks at work that require intense focus. You may also need to take rest breaks during the day. As your symptoms go away, you may be able to go back to your normal activities. The time it takes to recover from a concussion can vary from weeks to months. In rare cases, symptoms can last for years. If you have symptoms or problems that last more than 3 months, you may have a problem called postconcussion syndrome. Discuss this possibility with your doctor. These could be signs of a serious condition that needs treatment right away. Symptoms such as headache, nausea, vomiting, dizziness, or trouble thinking can happen right away, or they may come on gradually over time. Call a healthcare provider right away or go to the emergency room if a person loses consciousness after a blow to the head. Getting plenty of rest is an important part of treating concussions.